Apologies to my vegetarian friends, this one is all about the meat. 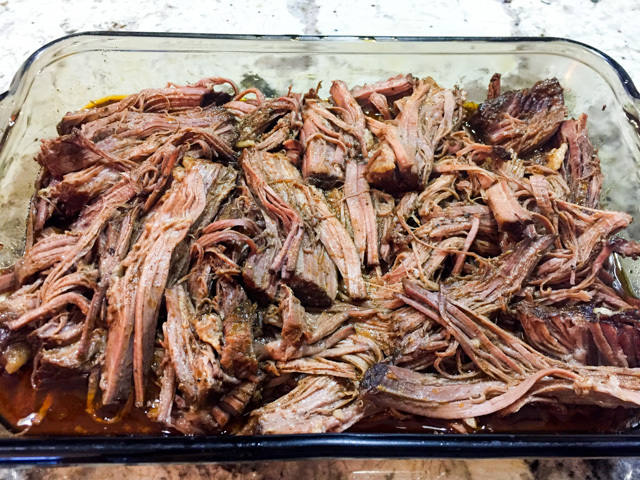 Brisket, in a very simple preparation, cooked in the crock pot for hours, until the connective tissue surrenders in all its glory. Chipotle peppers in adobo sauce. A small can holding a simple ingredient that imparts so much flavor and just the right amount of background heat. Love it. I found this recipe online and did a quick cut and paste of the ingredients, promptly forgetting to write down the link. Proper credit is not possible at the present time, if I ever find it again I’ll edit the post to include it. However, I modified the recipe a bit, so here’s to hoping that my crime is not worthy of too heavy a punishment. 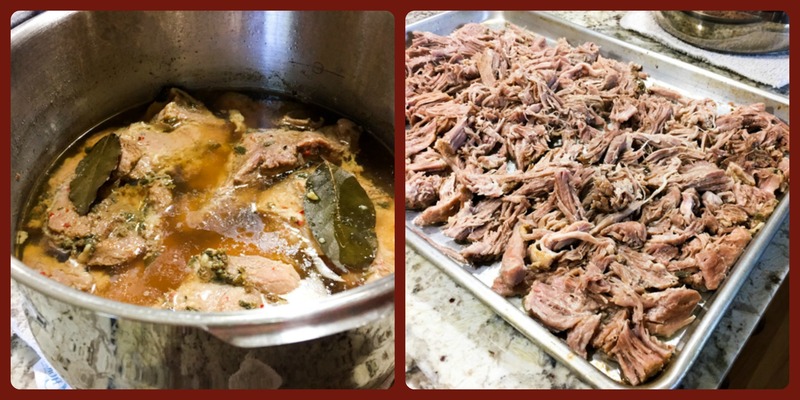 The recipe makes a ton of meat, which for us means leftovers galore. You can always have a taco party and invite ten of your best friends over…They can bring their pets too. It will be a huge batch of taco-happiness! Place bacon and chopped shallots in a 6- to 8-qt. slow cooker. Stir together salt and pepper; sprinkle over all sides of brisket. Place brisket over the bacon/shallot mixture. Process broth and all ingredients except apple cider vinegar in a blender until smooth; pour mixture over brisket. Cover and cook on low for 7 hours or until brisket is fork-tender. Transfer brisket to a 9- x 13-inch baking dish; cover with aluminum foil to keep warm. Pour sauce through a fine wire-mesh strainer into a medium saucepan, and cook over medium-high heat, stirring occasionally, reducing it for about 10 minutes. Stir the apple cider vinegar. 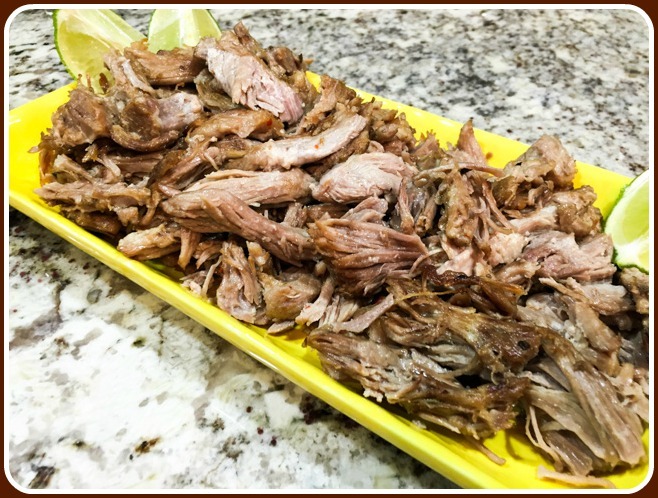 Coarsely shred the brisket, add the sauce and mix. Serve over tortillas, or white rice, with your favorite toppings. I served with avocado slices and crumbled Cotija cheese. Didn’t I tell you it made a H.U.G.E. batch? I tell you another thing, it was better a couple of days later. The interesting thing is that the heat of the chipotle peppers seemed to dissipate a little instead of getting stronger. Maybe it just permeated the dish in a more uniform manner. That’s probably the case. Next on my list? 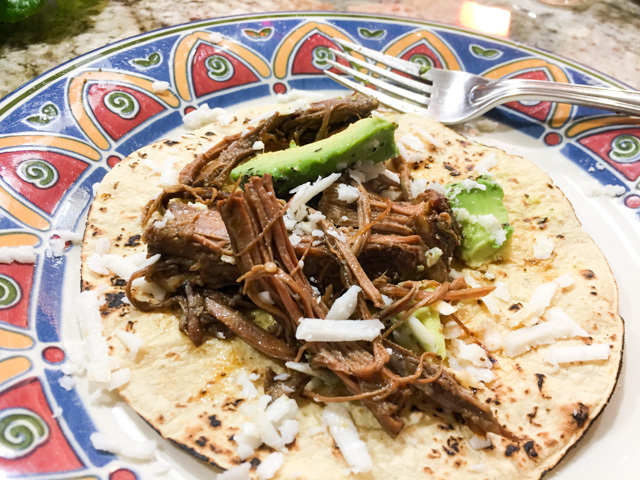 Short-rib Tacos. Go visit Karen’s site, and be ready to swoon! SIX YEARS AGO: Goodbye L.A. In a large heavy saucepan, heat the olive oil over medium-high heat. Add the minced shallot and cook until translucent, about 3 minutes. Add the tomatoes and bell pepper and cook for 3 minutes. Add the shrimp and cook for a couple of minutes. Stir in the tomato puree, oregano, bay leaf, and smoked paprika. Cook for another couple of minutes, remove the pan from the heat and reserve. Adjust seasoning with salt and pepper. Remove and discard the bay leaf. Heat a large heavy skillet over medium-high heat. Lay 2 tortillas, flat on the bottom of the pan, side by side. Put a small mound of cheese on 1 side of each tortilla. 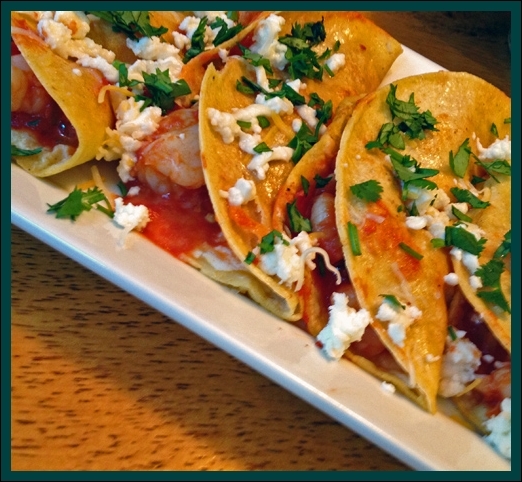 Wait until the cheese melts slightly, and then add about 2 tablespoons of the shrimp mixture to each tortilla. Fold the tortillas over into half-moon shapes and cook to melt the cheese completely, another 1 to 2 minutes. 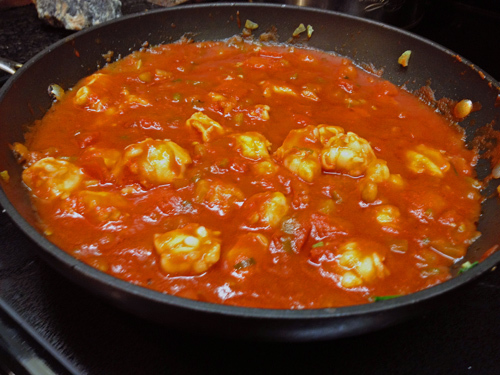 Transfer to a platter and keep warm.Repeat with the remaining tortillas, cheese, and shrimp mixture. Arrange the tacos on a serving platter and serve with lime wedges and hot sauce on the side. 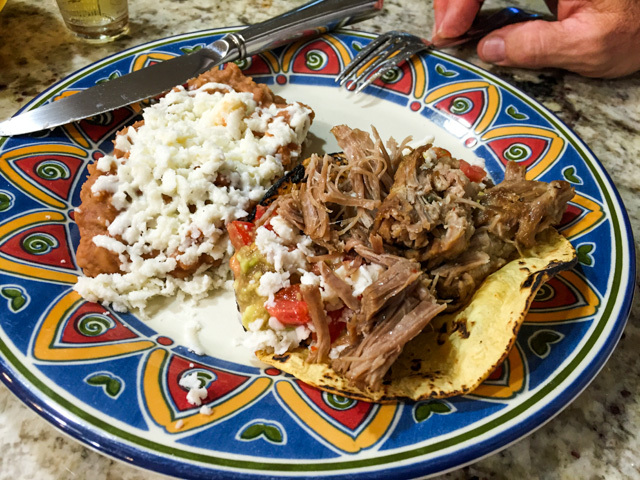 If you like Mexican food, tune into Mexican Made Easy, it’s always fun to watch Marcela preparing classic dishes, often with a healthier approach. Not much else appeals to me in the FoodTV these days, and that’s a little sad. With the tragedy in Newtown, 2012 could not have ended on a sadder note. That Friday I returned home early to wait for friends who were driving from Oklahoma to visit, and when I turned on the TV I couldn’t believe my eyes. 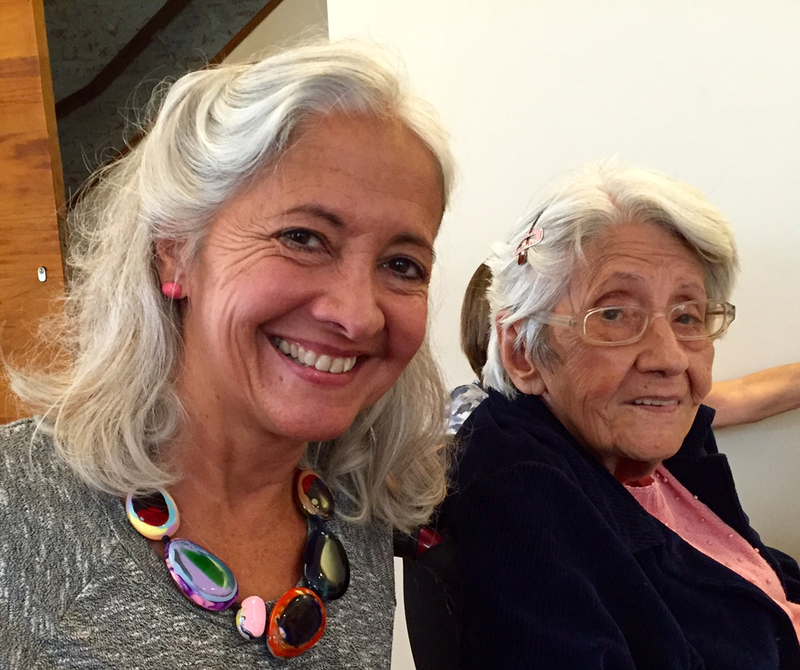 But nothing prepared me for the email I received shortly thereafter from my friend Farine, saying that her grandson Noah was among the young victims. I was folded in two, as if someone had punched me in the stomach. I know the same feeling hit thousands and thousands of people around the world, but it’s nothing compared to the pain of the families who lost their loved ones. It was such a senseless and cruel action. Farine mentioned that in his young life Noah struggled with an important decision: whether to become an astronaut or a taco store manager. He loved tacos so much. I’d have probably advised him to first become an astronaut, and then set up his taco shop on a beautiful, peaceful planet around some distant star… 😉 Today I share a recipe that I’m sure would please Noah. It’s found in “Just Tacos“, a book by Shelley Wiseman, who works in Newtown and was devastated by the catastrophe. Shelley not only gave me permission to print her recipe, she also asked me to dedicate it to Noah and his family. 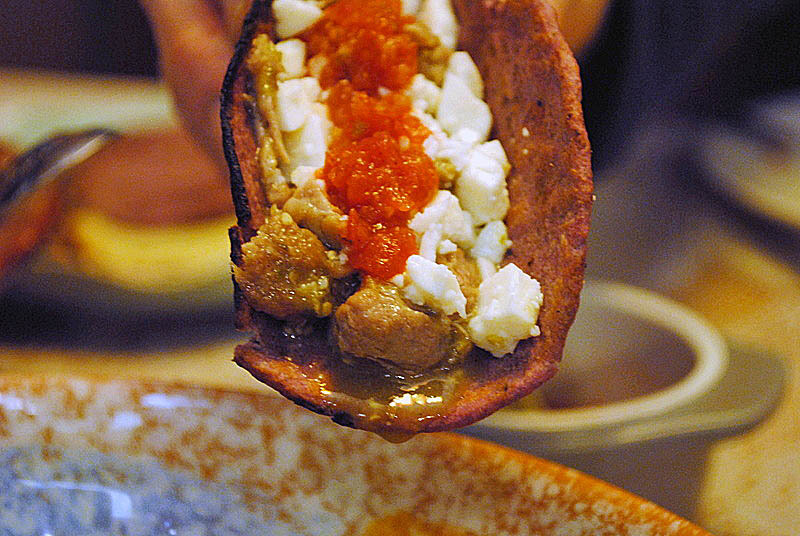 The tacos are ultra-special, as a result of their corn tortillas tinted with hibiscus flowers. 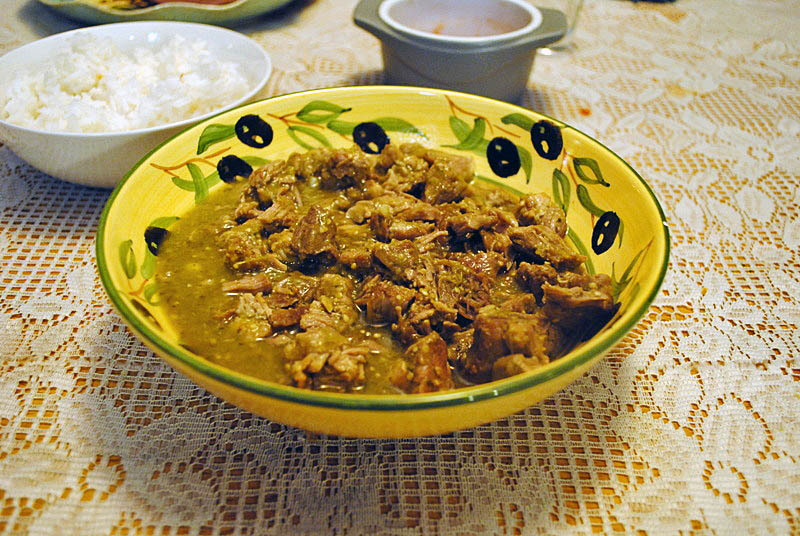 The pork cooked in tomatillo sauce is simply amazing! Bring the water to boil, add the hibiscus flowers and sugar, mix and simmer for 5 minutes. Let it cool until it is just a bit warm. You will not use all the tea for the dough. In a large bowl, mix the masa harina and salt. Add one and a half cups of the warm hibiscus tea to the flour, incorporate to form a soft, still moist dough. If necessary, add more tea. Let the dough rest for 5 minutes, than pinch small portions to make tortillas using a tortilla press. 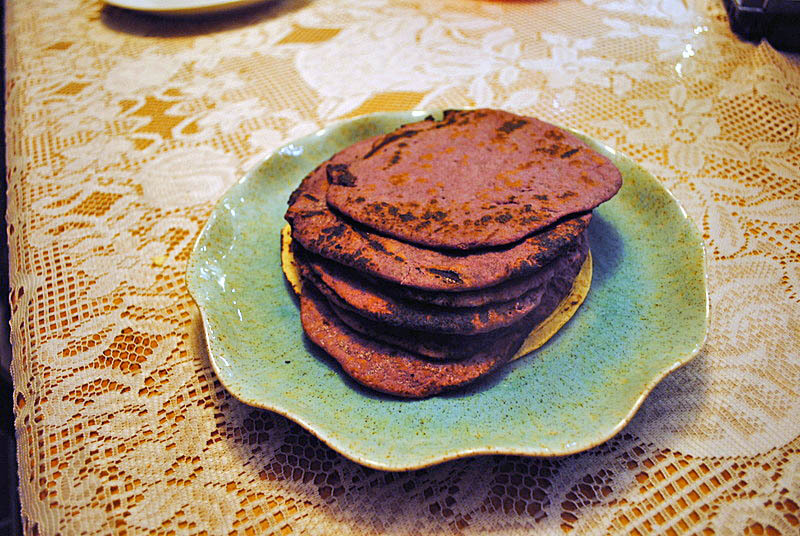 Cook the tortillas on a hot griddle or cast iron pan. Keep them warm in a low oven, covered with a damp cloth. Cover the tomatillos and Serrano chiles with cold water in a saucepan, and bring to a boil. Reduce the heat and simmer uncovered, until the tomatillos are tender but still intact, about 15 minutes. Reserve the cooking liquid. Heat the cumin, allspice berries, and clove in a small, dry skillet, shaking the pan until the spices are fragrant, about 1 minute. Put the spices in a blender along with 1 cup of the tomatillo cooking water and blend until the spices are ground. Using a slotted spoon, lift the tomatillos and chiles out of the remaining cooking water and put them in the blender along with the garlic, cilantro, and 1/2 teaspoon of salt. Blend until fully smooth. Reserve. Pat the pork dry and season with the remaining teaspoon of salt. Heat the oil in a heavy pot over medium-high heat and brown the pork in batches, without crowding, until brown on all sides. 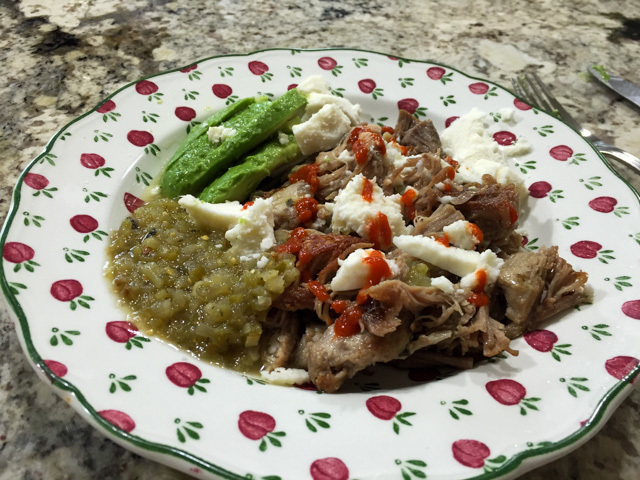 Return all the meat to the pan and add the tomatillo sauce. Bring to a simmer, then reduce the heat. Simmer the pork, covered, stirring occasionally, until the meat is tender and the sauce is thickened, one and a half to two hours. 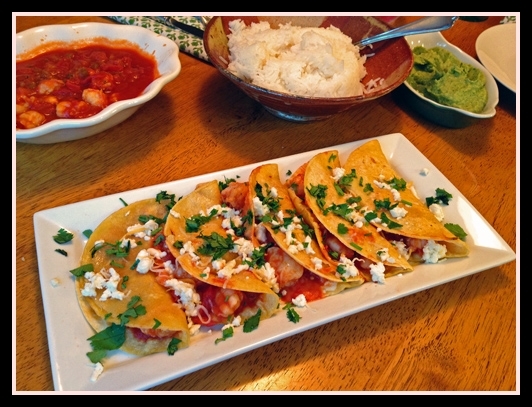 Shred the meat with two forks, return to the sauce and make tacos with the accompaniments of your choice. Comments: This dinner could very well be a special on Noah’s Taco House! 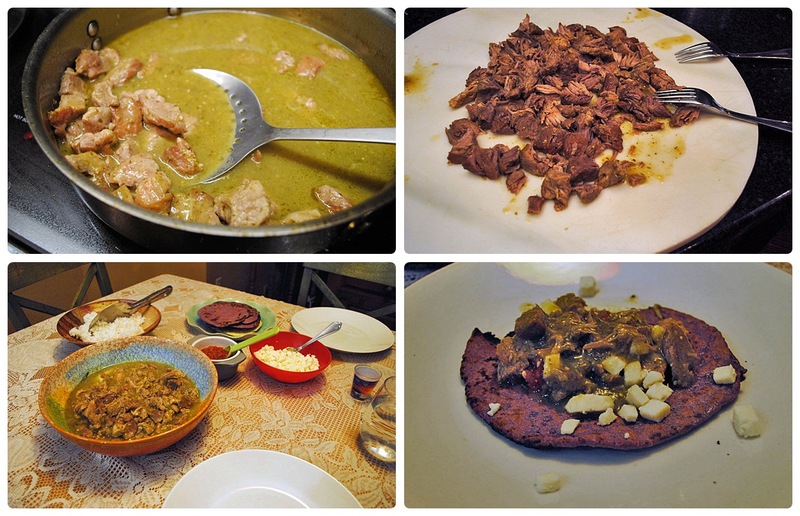 The pork in tomatillo sauce was probably one of the tastiest fillings for tacos I ever had! You can adjust the level of heat by leaving some of the Serrano chile out of the sauce, but for our taste the full amount had a nice kick. It is a perfect make-ahead dinner, as the flavors of the pork sauce intensify while sitting in the fridge. I close this post with a picture that I imagine would bring a huge smile to Noah. One of our dogs, Buck, always lays by Phil’s chair at the dining table and is usually very well-behaved. 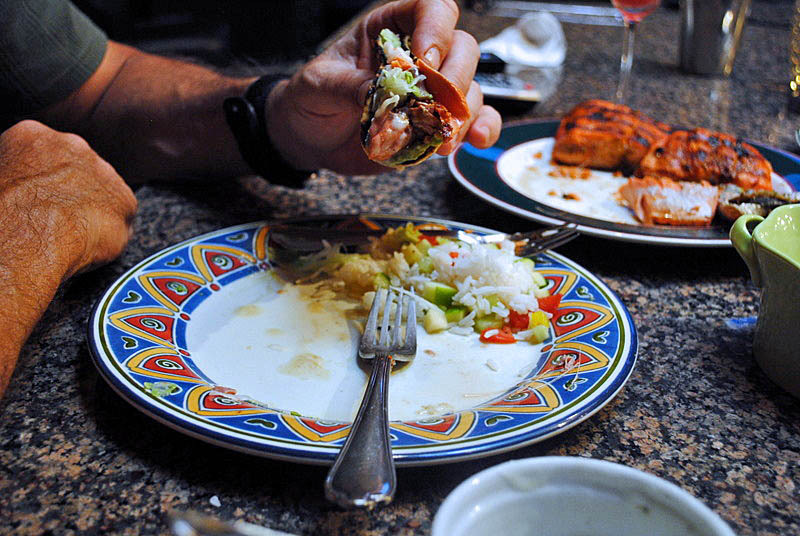 Somehow the smell of this dinner got to him, and every minute or so he would make his presence a little more obvious, standing up and touching Phil’s arm as delicately as possible with his paws. ONE YEAR AGO: Maui New Year! I’ve always twisted my nose at seafood tacos, considering them an abnormality of the gastronomic world. But, life has its own way of teaching important lessons and during our stay in Los Angeles, we sampled some fish tacos that made me reconsider my opinions. What can I say? I loved them, as well as the particularly incredible array of tasty salsas that place has to offer. 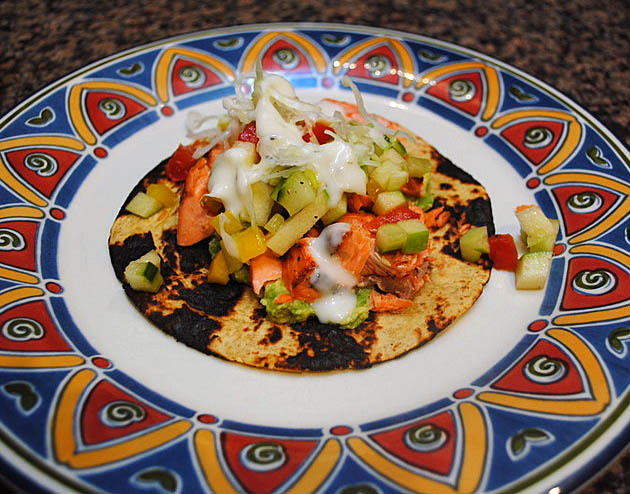 Since we came back, I wanted to make some type of fish tacos at home, and this recipe that I adapted from Food and Wine magazine was a perfect starting point. Prepare the salsa by mixing in a bowl the apple, cucumber, tomato, bell pepper, and onion (if using). Add the vinegar and sugar, season with salt, and reserve. It can be prepared hours in advance to intensify the flavors. In a small bowl, mix the yogurt with the lime juice, season with salt and pepper and reserve. In another small bowl, combine the chipotle powder with the orange zest and sugar. 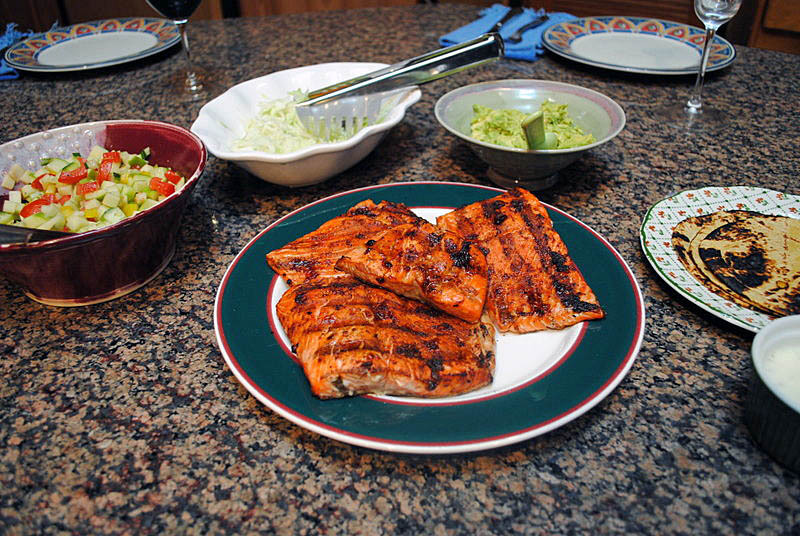 Rub each piece of salmon with 1 teaspoon of the olive oil and then with the chipotle–orange zest mixture. Let stand for 5 minutes. Heat the tortillas either in a low oven, wrapped in foil, or on top of a flame (my method of choice), until they are softened and heated through. Meanwhile, heat a grill pan. Season the salmon with salt and grill over high heat until nicely browned and just cooked through, about 3 minutes per side. Gently break each piece of salmon in half. 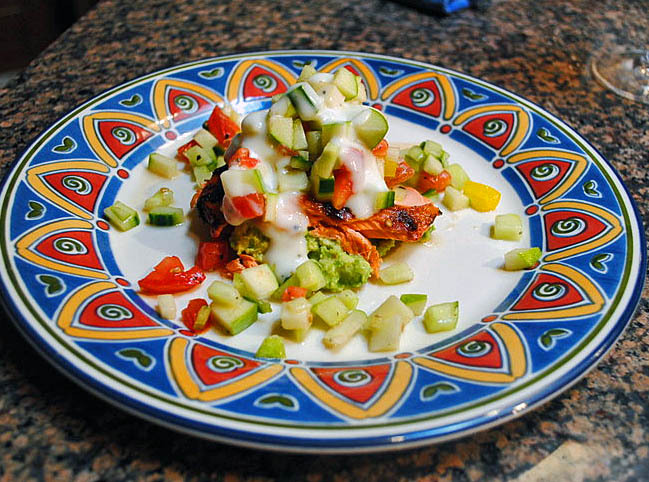 Spread the mashed avocado on the warm tortillas and top with the salmon, Apple-Cucumber Salsa and the cabbage. Drizzle each taco with the lime yogurt and serve right away. Comments: This simple recipe is like a symphony of flavors – the salsa has it all: spicy, hot, sweet, the green apple is the key ingredient. As to the cabbage, I’ve got a tip for you. If you love it in its raw state but the crunch factor seems a bit excessive, put the shredded/julienned cabbage in a small bowl, add very hot or boiling water to cover, count to 5 seconds and quickly drain it, rinsing it with plenty of cold water. This simple step softens it just enough, but won’t cook it. Perfect texture to top your tacos. This type of meal is a favorite of ours: all the ingredients spread on the kitchen island, and we can enjoy them whichever way we like, very relaxed, very Summerish! 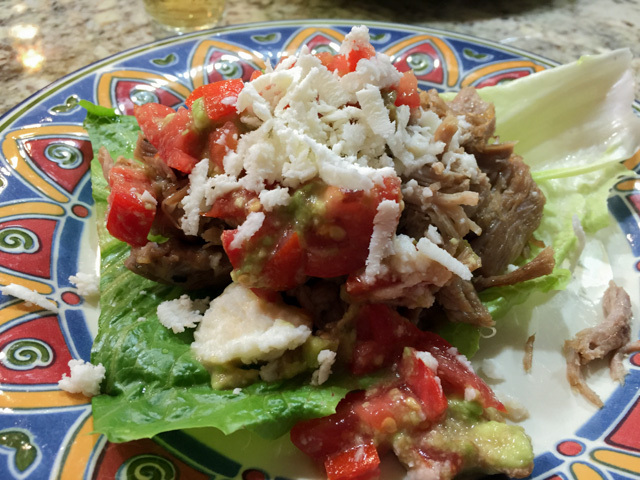 I sometimes go for a tortilla-less version, lighter but just as flavorful…. Whatever your preference, this meal is a winner! If you are not sold on the idea of a fish taco, please, try this one, you will be very pleasantly surprised.